An unavoidable part of Antarctic Peninsula cruises is crossing the Drake Passage. Apart from the high probability of gut-churning seas, it takes at least 2 full days, more if you’re headed further South. Fortunately one of the compensations onboard OneOcean’s Akademik Vavilov is a well stocked polar library, which included a number of photo books. Most of these books were either historical (Frank Hurley, etc) or recent monographs by well-known photographers. The latter tend to follow the fine art, “National Geographic” school - beautifully crafted representations of the natural beauty of the polar regions, in the style of the particular photographer. There’s nothing at all wrong with that, of course, it’s what pretty much all photographers onboard aspired to, however unrealistically, me included. And OneOcean make sure to have not only a excellent staff photographer on-board, but often as well a professional, known photographer as “artist in residence”, for example Daisy Gilardini, or in our case, Ira Meyer. But the book that grabbed my attention was somewhat different. First of all it stood out by having a stark, subdued cover photo. And second, much to my delight, it appeared to, and indeed did, contain exclsively panoramic photography. I had stumbled across “The Antarctic: From the Circle to the Pole“, by Stuart Klipper, and it turned out to be quite a discovery. 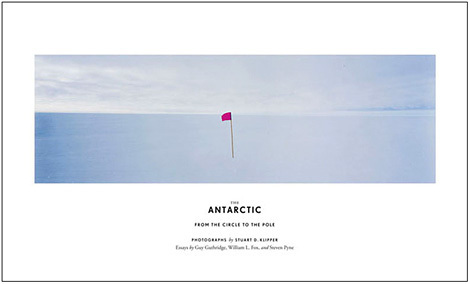 The photography featured in the book came out of a number of visits to the Antarctic as part of the US National Science Foundation’s artist and writers programme. This has given Stuart Klipper extensive and near-exclusive access to areas of the continent well off the tourist trail, and from these he has built up a fantastic body of work. This work is generally more aligned with the “extraordinary in the ordinary” ethos pioneered by Stephen Shore, but with the twist that there is little ordinary in this particular subject matter. It presents a much more reflective and impressionistic view than we usually see. His photographs often dictate no obvious focal point. The subject is the whole frame, and often at first glance it could seem void of interest. There are few “wow” moments. But give it a little time and space, and the otherworldliness of the scene starts to take hold. Far more than another shot of an impossibly blue iceberg against a dramatic sky, Klipper’s vast expanses of ice under soft, subdued light give you a true picture of Antarctica. And it doesn’t hurt that the majority of his work is made using the unattainable, unrealistic camera of my dreams, the Linhof Technorama 617. Which in a short documentary clip, he’s seen using handheld, for heaven’s sake! Finding further information about Stuart Klipper is not totally straightforward. He has a website, but to say it is inscrutable is putting it mildly. When you do manage to find anything written about or by him, he seems to come across as an erudite, engaging, committed, entertaining and slightly insane character. He’s certainly a million miles away from the standard pro landscape photographer type. He offers no workshops, no gear reviews, he doesn’t sell his work, at least not directly. He doesn’t even sell his book. In fact he doesn’t even mention it on his website. He does have a Facebook page, but that has only photos on it. Which, actually, is more than enough. His non-polar work is equally fascinating, and again mainly 617 panoramic. All in all he seems to pretty much a denizen of the “art” end of the photography world (actually I’ve discovered that he is an associate professor of art at the University of Colorado). Although it’s a bit glib to say so, I feel just a little bit validated by Stuart Klipper’s work. Although I enjoy “normal” photogaphy and try to do a good job of it, both myself and others have noticed that panoramic format work is where my heart really lies. And I have a lot of shots in my archive which could be taken for attempts at copying Stuart Klipper. So, as soon as I’d got a little immersed in “The Antarctic: From the Circle to the Pole” for the first time, I couldn’t resist going to grab my XPan, and spending some time outside in the southern reaches of the Drake Passage shooting a whole roll of essentially nothing, with a few chunks of ice floating in it. Totally undistracted by the later, unavoidable lures of penguins, whales, leopard seals and big blue icebergs against dramatic skies (and indeed anybody else on deck), I tried to let the approaching Antarctic speak to me. Coda - actually, doing a touch more Googling turns up quite a lot of references to Stuart Klipper, even on one of my favourite websites, The Online Photographer. I obviously haven’t been paying attention. It’s also gratifying to discover that pretty much everything I’ve read about him is more or less aligned with my own reactions. Film or digital, why ? When asked why he prefers the ‘wide-field’ format he simply says ‘because it’s wider’. Previous entry: (what) kind of blue ?